Warning: this post contains math, as well as highly technical knitting details. I took algebra in sixth grade, and then again in high school, and by the end of it I was reasonably good at solving for X and all that, but none of it ever seemed to have any practical application. It would have been different if I’d gone on to any kind of math-related career, but I’m a humanist at heart, and a literature subject librarian doesn’t solve a lot of equations, as a rule. However. I’ve been working on a sweater design, and sixth-grade algebra finally, finally came in handy. The sweater in question is a slouchy V-neck pullover for my mom, who requested something like a favorite sweater of hers. I had a bunch of measurements, including the depth and width of the V-neck. I’d already worked out that the neck opening would be 50 rows deep and 34 stitches wide at the widest, which meant I’d have to decrease 17 times over those 50 rows, because each decrease row involves two decreases, one on each side of the V-neck. The question was: which rows to decrease? Now, one could simply divide 50 by 17, get a result of 2.9, and decide to decrease every third row. But that would mean doing some of the decreases on the wrong side of the fabric, which knitters generally avoid doing because it looks sloppy. So I needed to do a certain number of decreases every two rows, and then the rest of the decreases every four rows, which is standard in a lot of knitting patterns. But how many decreases should I do before making the switch from “every two rows” to “every four rows”? What I had, basically, were two unknown variables. Let x = the number of decreases done every two rows, and let y = the number of decreases done every four rows. 2x = the total number of rows made while decreasing every other row. 4y = the total number of rows made while decreasing every fourth row. 2x + 4y = 50 (50 rows in all). x + y = 17 (because there are 17 total decrease rows), so y = 17 – x (or x = 17 – y). So 2x + 4y can also be written 2(17 – y) + 4y. 34 – 2y + 4y = 50. And then I solved for y, and figured out that I should decrease every other row 9 times (x=9), then decrease every four rows 8 times (y=8). And now I have a formula for decreases that I can use whenever I need it. I may have just saved myself a great deal of future time and effort. I feel like sending my middle-school math teachers a thank-you letter. I also think there’s a lesson to be learned here about math education. I remember my own early math education as an exercise in either tedium (lots of rote memorization, lots of repetitive sheets of problems) or panic (long division baffled eight-year-old me for the longest time). It was never fun; it never grabbed at my brain. But maybe you could teach kids math in a much more engaging way if you taught it through some kind of handcraft that involves calculation. Maybe you could teach programming that way, too, if you included some pattern design. At the very least, a curriculum that joined math to fiber arts might blow the (intensely stupid, deeply insulting) “I’m a girl, therefore math is hard!” stereotype right out of the water and consign it to oblivion, where it belongs. 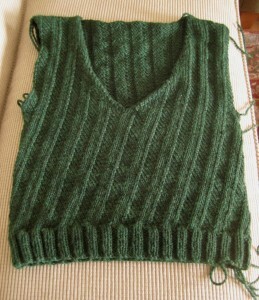 Oh, and here’s the sweater in progress. My next, less math-y challenge will be to put sleeves on it and finish it up before Christmas. Categorized under: Eat your heart out, Martha Stewart!, Math. Awesome! I love the maths that knitting involves. And this is such a pleasing solution. Wow, it took me a while to work this through — middle school algebra is MANY decades ago for me, but it was great fun! Glad you were linked it Knitty! Thank you, I will be using this my class in the next week or two. I am working with them on systems of equations. Perfect timing, thanks. I love the maths-y side of knitting and I often use algebra to solve problems like that. I don’t think I’ve ever managed to get it into simultaneous equations though: nice work. There’s a lovely book called Making Mathematics With Needlework that I think you might enjoy. That is a gorgeous sweater! Thanks for the kind words, everyone! I had no idea the Knitty blog had linked here until I saw the comments about it. Gosh.